We know that our customers constantly face new challenges. To combat these challenges, CLIMAX continually listens and learns from our customers to determine what type of tools they need to make their jobs easier. With that in mind, we designed a series of OD Mount Flange Facers that provide a safer, more convenient solution for small flange facing and give operators a wide range of machining options all in one package. 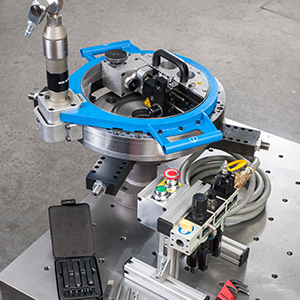 When machining small-diameter flanges, operators can accomplish jobs up to 30 percent faster compared to any other flange facer on the market. From their ability to machine up to seven different flange types to their revolutionary safety features, the OD Mount Flange Facers set a higher standard for safety and productivity in the industry. With three models to choose from, the OD Mount Flange Facers are capable of machining up to 36.5 inches (927 mm). While serving customers worldwide across all different industries, we know that our customers in the oil and gas sector face a different set of challenges that require specific repair and maintenance equipment to adhere to industry requirements and get the job done efficiently and safely. Leak-tight, high-quality flanges are crucial for oil and gas projects and applications. Replacing corroded or damaged flanges is potentially hazardous and could mean unscheduled downtime. Industry-Changing Safety: CLIMAX’s CE-certified OD Mount Flange Facers are meticulously engineered with safety in mind, setting a new standard for keeping operators safe and productive. The feed control is located on the outside of the machine, keeping the operator’s hands away from moving parts and minimizing the risk of injuries. The emergency stop allows for quick stops and controlled re-starts. The low-pressure drop-out prevents unintended restarts after the loss of supplied air pressure. 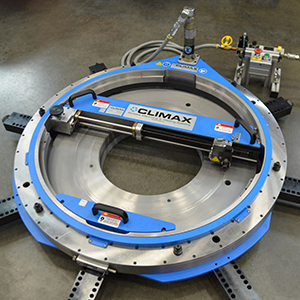 Versatile, Productive, and Efficient: CLIMAX OD Mount Flange Facers can machine seven types of flanges with no extra attachments required. The automatic and variable feed rate come standard for both radial and axial feed, providing a host of benefits including significant time savings, easy machining of various types of materials, and a high-quality surface finish. In addition, the tool head rotates to any angle and includes standard preset angles of 0°, 23° and -23°. High-Quality, Robust Design: The high-quality design of these OD Mount Flange Facers means they are built to last and backed by CLIMAX’s commitment to creating the highest quality tools on the market. An engineered hard stop is built in to avoid broken shear pins in the event of a crash. When these machines reach their hard stop, they can quickly and simply be reset to keep projects moving. The robust chucking mechanism and unique bearing design provide superior rigidity and machining performance. These OD Mount Flange Facers can machine tough applications from pipe-to-pipe connections, valve flanges, flat flange rework, RTJ rework, heat exchangers, boiler and vessels, hub machining, manway doors, and column inlets and outlets. Does this sound like the perfect tool for your project or company? Contact us to learn more about the product or to determine the right flange facing solution for your business. 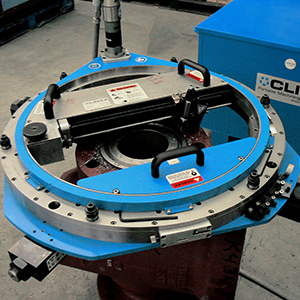 In addition to the OD Mount Flange Facers, we offer a wide variety of rugged and innovative portable flange facers for machining flanges up to 120 inches (3048 mm) in diameter, in ID or OD mounting options. CLIMAX training experts are located around the world and are readily available to help get you up-to-speed on the latest technology.